space adjacent. Small, bare areas in the residential sections would be playgrounds for small children. to the already existing Canal Zone towns. Taylor B. Lewis, and Melvin M. Rotsch. Associate Professor of Civil Engineering. water supply and waste disposal, Mr.
Lewis for highways and traffic, and Mr.
college students home for vacation. almost 300 who applied for summer work. summer workers of that period are B. I.
plan began to recover late that decade. 1941, and 164 the following summer. Orlando Smith of Ancon, and Robert J.
college credit for his Canal Zone work. philatelic mail for the new stamp issues. every day and now I've got a new interest." man Andrews, Edward D. McKim, Major General Julian L. Schley, Lieutenant General R. A.
Karl R. Bendetsen, B. F. Burdick, John W. Martin and Daniel E. Taylor. Conference" August30 at Balboa Heights. floor of the Administration Building. study is now in progress. ily needs but on a short-term basis. Panama Canal Company came into being. three liners on their north and south runs. several months can be examined. at Summit, Cardenas, and Margarita. conference," Lieutenant Governor H. D.
they were a great help," they say. on the clerical end of police work. Ancon, 70 units; Diablo, 12; Balboa, 12.
percent of the apartments will be cottages. was graded earlier this year. clude both cottages and duplexes. struction has been going on this year. lington plan to leave the Isthmus early in October. make their future home somewhere in the Carolinas. months, and 22 days; Florida. five months, and 27 days; Cristobal. percent improvement over our best year. Storehouses, and Division of Sanitation. Roll Award for the best record for July. use of sharp tools and power equipment. 6. Foreign matter in eyes. caustic materials and kitchen equipment. ment as potential sources of danger. for safety of man and machine. such as goggles, gloves, safety shoes, etc. tices to your supervisor for correction. around the Canal Zone schools these days. reading and writing and arithmetic. senior high schools on the Canal Zone. made in the schools this year. found in new jobs or new locations. Gatun Elementary School, and Mrs.
oldtimers at a ceremony at the Mount Hope Ball Park. Gamboa Legion Hall, 7:30 p. m.
V. F. W., Post No. CIL, Union Church, 7 p. m.
Lodge Hall, 7:30 p. m.
K. of C. Hall, 7:30 p. m.
Balboa Hall, 7:30 p. m.
Scout Building, Cristobal, 7:30 p. m.
397, Balboa Lodge Hall, 7:30 p. m.
595, Balboa Lodge Hall, 7 p. m.
Fort Clayton, 7:30 p. m.
BALBOA LOST last month one of its oldest and best known landmarks. in 1906 and was moved to Balboa in 1914 when it became the Balboa Central Police Station. Bureau, the Silver Personnel Bureau, the Girl Scouts for storage, and the Schools Division. Since 1938 the upper floor has been used as a girls' dormitory for the Canal Zone Junior College. was given recently by Governor Newcomer. States Senator from South Dakota. fiscal year by the Safety Branch. assume his new duties next Monday. several occasions as Acting Magistrate. patchers' office was white with writing. Dispatcher R. L. Dickerson said. Cut before any southbound ships arrived. that it was starting its 13th ship. the work of the 14 marine dispatchers. plained, "can be learned only by osmosis." they are no less than 24 hours from port. to the dispatcher by the agents. confer again and later in the morning Mr.
Dickerson decides with Thorwald H.
require only a clear Cut. estimate or overestimate arrival time. mav be delayed several hours." range for its removal min Cristobal? vessel they were about to board. --- -* -.- 4 1.
force of the two Port Captains' offices. tion Division, is Capt. West at Balboa. patcher what time he is to pass Gamboa. but Cristobal has more harbor work. holds a similar post on the Atlantic Side. patcher is Merwin A. French, with J. T.
Oliver in a similar post on the Pacific Side. the Cut and traffic is at its peak. Jamaica he came to the Canal Zone June 17, 1909.
registered yesterday at Local Boards No. istrant, Selective Service Director A. C.
to take between one and two months. Registrars spent a busy day yesterday. registrants had not been compiled. States vacation of Board Chairman F. H.
direct hand in caring for the Zonian's well-being. s former General Manager, V. J.
with sales representatives located on the Isthmus. with which we could not otherwise expect to become acquainted. agencies of the desired goods. varying incomes and expenditure budgets. months from now-is much more difficult. located in each retail store. the Panama Canal Company," Col.
the fine work of each and every volunteer. Canal Zone as a whole." Kenneth R. A. Booth, Lawrence C.
Callaway, Robert A. Engelke, Everett L.
Farlow, William D. Hardie, Doris R.
Kintigh, Betty Lu Malone, Gladys E.
Napoleon, Hans P. Pedersen, Florence M.
Melvin E. Walker, and Ella E. Wertz. Muriel C. Treadwell, and Josephine P.
bitt, Lee R. Beil, Mirt Bender, James P.
Boukalis, Bernard J. Brown, Benjamin S.
Chisholm, John J. Crawford, Robert D.
Kerner E. Frauenheim, Fletcher R.
O. Parker, James W. Riggs, William J.
George C. Wright, and James M. Zelsman. Guy R. Exon, Roy E. Graham, Arthur J.
Hanson, Murray D. Hawk, Russell E.
Kellar, Walter R. Lindsay, David H.
Elhone, William D. McGowin, James W.
A. Romeo, Hugh B. Smith, Wesley H.
Townsend, and John E. Winklosky. Carl P. Hoffman, Sr., Pasquale P.
Monaco, DeWitt E. Myers, Harry D.
Raymond, William N. Taylor, James M.
Thompson, William F. Young, Joseph L.
William T. Harness, Henry H. Lee, Jr.
Ellis J. Lowe, Robert Lowry, John A.
Morales, Gordon E. Walbridge, Fred E.
Wells, and Russell T. Wise. all because of a hearing aid. or the Cape of Good Hope. largest, at Gatun, involved 2,500 men. service, with the Canal or other agencies. service are indicated by (*) asterisks. *S. L. Churchill, Sergeant, Fire Division. I> -. ,. * ^ .. .
El Panama, Friday evening, November 9.
rangements for the Fire Fighter's Ball. Tickets will go on sale in the near future. after a brief visit here. of the Chief Engineering Branch. after his graduation from Iowa State. graduate study at Harvard University. acted by the Civic Councils. solicitation in the local-rate communities. Chest are now being prepared, Mr.
that will keep you laughing all the way home. You all have seen, no doubt, the previous laugh-classics featuring the antics of Mr.
U-. _- _... .. .. O- fA- 7, A .----... ----I t't. f t t_ .. 1 ... L .. ..C.. .. .. ... . ...... .... .
582.14; expenses, $153.06; net, $1,429.08. the 1951-52 drive next month. man and Mrs. Johnston as director. amounts they received are shown below. agency's share of the campaign expenses. Clerk, Balboa Office, Housing Division. II) Electrical I division . to Architect (general) Engineering Division. Cold Storage Plant, Commissary Division. sent a picture of the birth of a town. which would have divided the townsite. quarter-mile distant from a play area. driving, Mr. Lewis pointed out. more level center space of the horseshoe. yards would provide an area for what Mr.
moved from the residential areas. mills and foundries in the United States. istrator for the Panama Canal Company. lection of scrap metal for the war effort. were engaged in the program. duction program may be seriously affected. in processing scrap before it is shipped. some of the material to proper size. ment after being classified and cut. Gift of the Panama Canal Muiaum W^i-mO 1HÂ£ BALBOA HEIGHTS, CANAL ZONE, SEPTEMBER 7, 1951 5 cents Vol. 2, No. 2 TOWNSITE PLANNING IS IN ADVANCED STAGE FOR NEW TO WNS OF SUMMIT AND CARDENAS Study By Specialists Will Aid Canal Plans For New Construction Recommendations of three townsiteplanning specialists who have spent the summer on the Canal Zone will be incorporated into the new towns of Summit and Cardenas. Studies they have made during the past 10 weeks will also be utilized in planning the extension to Margarita and in future improvements to the already existing Canal Zone towns. The three specialists are H. M. Gifft, Taylor B. Lewis, and Melvin M. Rotsch. Mr. Gifft and Mr. Lewis are sailing today for New York to return to Cornell University where they are, respectively, professor of Sanitary Engineering, and Associate Professor of Civil Engineering. Mr. Rotsch, Assistant Professor of Architecture at Texas Agricultural and Mechanical College, is leaving tomorrow to return to Texas. Experts in their lines Â— Mr. Gifft for water supply and waste disposal, Mr. Lewis for highways and traffic, and Mr. Rotsch for housingÂ— they have assisted Canal Zone planners on the new townsites and the revamping of the older towns. Their recommendations are in connection with street patterns, grading, housing sitesÂ—especially the adaptation of housing to the Canal Zone's generally rugged terrain, and the waste disposal problem. City planning, Mr. Rotsch told a group of engineers recently, is a comparatively new profession. The place to start such planning is a growing town but too often municipal planning is not done until a town becomes a city, he said. First City Planning In 1880 There was no city planning, in its present sense, until the late 1800's when the first "satellite" towns were planned outside of London but there was no general movement in the direction of overall planning until after World War I. Harvard University had one of the first such schools, opened in 1932, and other universities and colleges are now offering city planning courses in connection with their schools of architecture, landscape architecture or engineering, either as graduate or undergraduate work. The three specialists have collaborated with the Civil Engineering Branch on future plans for Margarita, Paraiso, Ancon, Silver City, and the new towns of Summit and Cardenas. The studies of Summit are far enough (See page la) P 5P.Â™SÂ£D TOWNSITE OF SUMMIT C.7 SUMMIT, the new U. S. rate townsite, is shown above, in model form and as projected by townsite planners. An arrow in the lower left points north and the town is seen as if from a plane flying toward Cristobal. The thoroughfare at the left w r hich splits at the town erttrance is Gaillard Highway. The large buildings in the center of the photograph are the civic center Â— commissary, clubhouse, postoffice, and schools area. The main buildings are laid out in a hollow square with streets passing behind the buildings and parking space adjacent. Small, bare areas in the residential sections would be playgrounds for small children. Canal Buys Over $1,500,000 In Panama During Past Year Purchases totaling more than $1,525,000 were made by the Canal organization in the Republic of Panama during the past fiscal year, according to the annual report of the Supply and Services Bureau. These were exclusive of purchases made by armed forces or other Government agencies in the Canal Zone. Nearly half of these purchases, in dollar value, were Panama beef cattle and other agricultural produce of a varied nature. Meat purchases for the year totalled nearly $395,000, while slightly over $315,000 was spent for agriculture products, mostly fresh fruits and vegetables. Other purchases listed by the Supply and Services Bureau included the following: Industrial products, $325,000; beverages, $110,000; forest products, $53,000; and miscellaneous items ranging from oystershells to advertising, $335,000. The heaviest buying was during the months of January, February, and March, when meat and agricultural produce deliveries were heaviest. The monetary value of the products bought that period amounted to over $520,000. Purchases in the other three quarters of the past fiscal year averaged well above $300,000. The Canal organization has long followed a policy of making local purchases where quality, supply, and price meet requirements. This policy has the double objective of stimulating local agriculture and industry as well as the elimination of costly handling and shipping charges required on products bought elsewhere. During recent years the principal purchases, in money value, have been beef, cement, lumber, sugar, building materials, and fresh fruits and vegetables. While Panama beef constitutes the principal item of the meat purchases, other meats are bought in considerable quantities when available. These include chickens, turkeys, lamb, pork, fish, lobster, and shrimp. Locally produced sugar has been a major item bought from Panama producers during the past two years. The great variety of produce bought in the Republic of Panama (See page IS) FEATURES IN THIS ISSUE # Think you have a ticklish job? Read about the troubles of Marine Dispatchers In making the Canal transit schedules. See page 8. Â• A complete list of those employees from the Canal organization who participated In the Civilian Antiaircraft Training program. See page 11. General plans for this year's house building program are described in this Issue. See page 4. September 7, 1951 THE PANAMA CANAL REVIEW SIX MEMBERS of the Panama Canal Company Board of Directors who met in the Canal Zone last February are shown above in committee sessions. They are, left to right: T. Coleman Andrews, Edward D. McKim, Major General Julian L. Schley, Lieutenant General R. A. Wheeler, Governor Newcomer and W. R. Pfizer. Others who met with the special committee to consider problems of the Canal's reorganization, shown, are Arnold Bruckner (standing), Robert E. Maxwell and Lieutenant Governor Herbert D. Vogel, Vice President of the Panama Canal Company. The Board is scheduled to meet this month in Washington, D. C. Other members of the 13-man board are Frank Pace, Jr., Secretary of the Army, Major General Glen E. Edgerton, Karl R. Bendetsen, B. F. Burdick, John W. Martyn and Daniel E. Taylor. Atlantic Side Hospital Survey Under Way, Governor Tells Shirtsleeve Conference A survey of hospital facilities on the Atlantic side is now being made, Governor F. K. Newcomer told the "Shirt-Sleeve Conference" August 30 at Balboa Heights. The conference met in the enlarged and re-decorated Board Room on the third floor of the Administration Building. In answer to a question from Rufus Lovelady, President of A. F. G. E. Lodge No. 14, on rumors that Colon Hospital is to be closed and Margarita Hospital reactivated, Governor Newcomer said that a study is now in progress. Since the Atlantic side population center is shifting from Cristobal to Margarita, consideration is being given to the possibility of reopening the Margarita Hospital, he said. The survey which has been requested from the Engineering Division will provide a basis for a decision whether it would be better to spend money on Margarita or Colon Hospital. The Engineering Division, the Governor said, has been asked for an estimate as to the probable cost of putting the Margarita establishment back into shape where it would be a good hospital. The hospital question was one of two concerning medical facilities on the Canal Zone which were reported by the Governor. A few minutes earlier he had announced that the medical clinics (dispensaries) in Pedro Miguel, Ancon, and Balboa are to be closed, because of the current and acute lack of doctors to staff them adequately. To replace these dispensaries, Wards 1 and 2 of Section A at Gorgas Hospital will be set up as a central dispensary. This will enable centralization of the doctors from the three towns and, the Governor believes, will provide better patient service. The change will be made as soon as the proper facilities can be installed in the two hospital wards. First aid stations will be set up in Pedro Miguel and, possibly, Balboa. Another important announcement made during the conference concerned the rental of furniture. Effective September 1, the Governor said, rental charges on furniture will be adjusted and the arrangement made that those renting furniture will own the furniture they now rent, after the payment of eight months of the new rate. After next May there will be no more furniture rental except to new employees, who will continue to be furnished with basic furniture proportionate to their family needs but on a short-term basis. The rate adjustment has been made in view of the 2,300 separate furniture rental accounts which were being maintained under the old rental plan. Some of these were for amounts as low as 11 cents per month. Generally, under the new system, those paying furniture rental of between one cent and $1 will pay a $1 rental charge; those paying between $1 and $2, will pay $2, etc. Questions raised during the August conference covered subjects from musty flour to school bus rates. An unusual feature of the most recent informal discussions was that most matters were raised by Atlantic siders who, one man declared, considered themselves classed as "secondclass citizens." Governor Newcomer opened the conference with a breakdown, promised at the last meeting, of the retail cost on a storehouse item. Mimeographed sheets giving the breakdown were supplied to each conferee. When the Governor read a memorandum from the Schools Division that, unless higher bus rental rates are made by the Motor Transportation Division there will be no increase in school bus fares, Raymond Ralph of the Gatun Civic Council protested that the Gatun rates had just been increased. Further discussion disclosed that Gatun is using concession busses and when Mr. Ralph learned that the Pacific side children had transportation from the Motor Transportation Division, he asked why Gatun could not have the same thing. A telephone call by Lt. Gov. H. D. Vogel to the Supply and Service Bureau established that government busses can be provided if Gatun wishes to make a change. Other matters, including a number of personal problems, which were brought up included: a report that gasoline being sold in Gamboa comes from Navy supply and Directors To Consider 1953 Budget For Canal At September Meeting An examination of the Panama Canal Company's proposed budget for the coming fiscal year will be one of the principal items on the agenda of the September meeting of the Board of Directors. The meeting, originally scheduled to be held in the Canal Zone, will be held September 17 in Washington, D. C. It will be the first Board meeting since the Panama Canal Company came into being. Governor Newcomer, President of the Company, has announced that he will bring to the attention of the Board of Directors preliminary reports on a possible change in Panama Line schedules with a view to instituting more formal studies if deemed desirable. It was announced last month that preliminary studies have been initiated to determine the possible advantage of using a more southerly port than New York for the northern terminus of the line. The present studies have included an investigation of possible schedule changes which would permit ports of call for the three liners on their north and south runs. The problem is primarily an economic one and will require much additional study and data before any change is made in event the Board of Directors consider further studies worthwhile. The 1953 fiscal year budget figures to be presented at the September meeting are only in the preliminary stage and do not take into consideration any rate changes which may later be required. It is not expected that the Board will consider any material changes in any Company rate schedules until the financial results of operations for a period of several months can be examined. is of inferior octane rating, which was checked by Col. Vogel, with the report that the gasoline comes from Panama Canal tanks and is identical with that sold elsewhere on the Canal Zone; an appeal on behalf of retired employees by several civic council representatives to the effect that these retired employees be permitted to retain quarters; a question as to why employees' cars cannot be unloaded from incoming southbound ships on the day of arrival as is done in New YorkÂ— the answer being that this is a question of loading and number of cars carried; compulsory insurance on automobiles, and the marked increase recently in flies on the Atlantic side. Those attending the meeting were the Governor and Col. Vogel, E. A. Doolan, Personnel Director, and Forrest G. Dunsmoor, Executive Assistant to the Governor, for the Administration; Carl W. Hoffmeyer, Mr. Tobin, Albert Saarinen, W. R. Howe, E. W. Hatchett and Walter Wagner for the Central Labor Union-Metal Trades; Vincent Biava of Gamboa, F. J. Moumblow of Gatun, Charles A. Garcia of Balboa, J. H. Jones of Pedro Miguel, Boris Creich of Cristobal-Margarita and Raymond F. Ralph of Gatun, for the Civic Councils; Chester A. Luhr for the Locks Employees; Ed Brown for the Marine Engineers; James Boukalis for the Machinists; Robert C. Daniel for the Railroad Conductors, and H. J. Chase and Mr. Lovelady for the A. F. G. E.
THE PANAMA CANAL REVIEW September 7, 1951 Quarters Program for 1952 Provides for Over 500 Units Electrical Engineer To Retire This Month Approximately 500 quarters units are scheduled for construction during the current fiscal year, according to present plans. The total is divided about equally between the Atlantic and Pacific sides of the Canal Zone. This year's program, part of the long-range "$80,000,000 housing and townsite development plan, calls for the expenditure of about $11,000,000. It is expected that much of the construction work will be done by contract but exactly how much will depend on bids received. At the present time, plans call for the construction of the following: Silver City townsite extension; Paraiso townsite extension; quarters in Ancon, Balboa, Diablo Heights, Gatun and Margarita, Paraiso, and Silver City; together with clearing, grading and site preparation, including utilities, for next year's building at Summit, Cardenas, and Margarita. The first bids to be solicited will be for the Silver City townsite extension the latter part of September. Number Of Units Not Settled A final determination on the exact number of quarters to be built during the fiscal year has not been made, except in a few instances. At July's "Shirt-sleeve conference," Lieutenant Governor H. D. Many Student Assistants Employed During Vacation (Continued from page 2) assigned one girl to its Main Office where she typed, did routine filing, and answered the telephone; another girl to similar work in the t?lephone exchange; one boy to general helper's duties at the Cristobal Transformer station; another to the Gatun Hydroelectric station; and the third to the Balboa substation. The License Section used its boy and girl assistants on general office work "and they were a great help," they say. The Police Division put its girl assistant to work at headquarters, its boy at the Balboa station, both of them helping on the clerical end of police work. Help On 4,000 Files The Personnel Bureau used six student assistants to eliminate extraneous matter from more than 4,000 files, processing applications, tracing records, and readying for filing such material as job descriptions. The Meteorological Branch used Perry Young for taking weather observations, helping change seismograph sheets and even sent him on a three-day hydrographic observation trip to the headwaters of the Boqueron River. The Locks Division had five student assistants, the boys bringing up to date records of miscellaneous drawings and the girls typing. And there were others: Three in the Municipal Division; six in the Dredging Division; two in the Housing Division; a student typist in the Engineering Division; three in the Aids-to-Navigation Branch; two in the Commissary Division; eight Â— most of them were connected with the summer recreation program Â— in the Schools Division; and three with the Clubhouses. Vogel reported the following plans for U. S.-rate quarters: Margarita, 100 units; Ancon, 70 units; Diablo, 12; Balboa, 12. Final plans have been approved for 14 units in Balboa and 10 units are also scheduled for Gatun. Final plans for 118 local-rate quarters have been approved for the northern section of Paraiso and of 96 units at Silver City. The type of the houses to be built in Margarita has not been determined, but the buildings probably will be mostly of masonry construction. No decision has been made as to how many of the 100 will be cottages and how many will be duplexes, although if the previous construction pattern is followed, about 40 percent of the apartments will be cottages. Types To Be Determined In Ancon, again, the exact types are not definite. Final plans covering some promising new designs are being rushed to completion. Most of the new Ancon housing will be in the Ancon BoulevardChagres Street area where a large area was graded earlier this year. The new housing in Diablo will be constructed on Endicott Street, where an area is to be cleared behind the old messhall. These houses will be of masonry, on-the-ground construction, and will include both cottages and duplexes. The Balboa apartments will be built on Pyle Street and the adjacent lower end of Morgan Avenue, and will include both cottages and duplexes. They will be composite, off-the-ground construction, similar to the new houses in the San Juan Place area in Ancon. The 10 apartments at Gatun will probably be masonry, the type not yet definite. They will be built on the high ground along Jadwin Road where construction has been going on this year. A. C. Garlington, who came to the Canal Zone in 1910 and has served as Electrical Engineer for the past 24 years, will voluntarily retire from Canal service at the end of this month. He and Mrs. Garlington plan to leave the Isthmus early in October. Their plans are still indefinite but they expect to make their future home somewhere in the Carolinas. Retirements In August Employees who retired at the end of August, their birthplaces, titles and length of service at retirement, and their future addresses are: Leon Borden, Austria, Senior Machinist Foreman, Building Division; 25 years, five months, and 22 days; Florida. Edward E. Ellis, New Jersey, Clerk, Receiving and Forwarding Agency ; 30 years, five months, and 27 days; Cristobal. Patrick J. Henry, New Jersey, Chief Engineer, Towboats, Navigation Division; 22 years, five months, and 16 days; Brooklyn, N. Y. Herbert R. Judson, Massachusetts, Chief, Coupon Section, Audit Division; 32 years, nine months, and 17 days; Balboa Heights. Benjamin F. Kuller, Jr., Pennsylvania, Filtration Plant Operator, Mount Hope; 25 years, two months, and 12 days; Franklin, North Carolina. TOUR HEALTH An excessive number of visitors for hospital patients can do much to hinder their recovery according to one of Washington's leading medical men. The June issue of the Medical Annals of the District of Columbia carries the following article by the Association's outgoing President, Dr. William M. Ballinger. It is presented here for the thoughtful consideration of those who may have relatives or friends who are Canal Zone hospital patients. "Have you ever considered the problem of hospital visitors? From the patient's viewpoint it seems certain that the fewer the better. They disturb his rest, interrupt his carefully planned routine, interfere with his medications and often his feedings, and tire him to the point of hindering his recovery. "From the doctor's viewpoint, visitors are almost totally a menace. They bring in current acute infections; they frequently interfere with the attending doctor's daily check-up and bedside consultation; and all too frequently they are the cause of confusion of ideas and understanding not only of the patient himself but also between the patient and his physician. "From the hospital's viewpoint, visitors are most certainly a great burden and a nuisance. They take up a great deal of the nurses' time in answering endless questions. They crowd the elevators, spread confusion and litter throughout the wards, thus necessitating the hiring of extra help, which in turn increases the cost of maintenance. "Isn't it time we do something about all this? We should start immediately by educating our patients and the public that visitors have no place in the hospital sickroom. Coincident with this, hospitals should pass new rules drastically curbing visitors. One or two only of the patient's immediate family or intimate friends should be allowed visiting privileges, but no more than one or two." THE PANAMA'CANAL REVIEW September 7, 1951 White Schools Reopen After Summer Recess Hundreds of new facesÂ— most of them are very young faces Â— are being seen around the Canal Zone schools these days. Most of them are the ex-kindergarteners who graduated from fingerpainting and rhythm bands to the more adult world of reading and writing and arithmetic. The Canal Zone's white schools opened last Wednesday. The total enrollment has not yet been compiled but school officials expect it to be close to last year's figure, approximately 4,900. This figure covers the 14 elementary, junior and senior high schools on the Canal Zone. Other than the increased tuition charges announced several months ago and increases in pay, effective today, for substitute and night school teachers, comparatively few changes have been made in the schools this year. A full school schedule, kindergarten through sixth grade, is being given at both the Fort Kobbe and Cocoli elementary schools. Children from Cocoli proper are attending the Cocoli school; all other West Bank children are enrolled at the Fort Kobbe school. The latter was opened as a school for the first time last year. At first only grades one and two were taught but last April additional grades were transferred to the Kobbe building. Ancon elementary school, which had only five grades last year, will have six grades again this year. In addition to the new faces among the student population, there are new faces in the 162 man and woman teaching staff; some familiar faces are missing temporarily this year and others will be found in new jobs or new locations. Twenty-five new teachers for the secondary schools and 13 elementary school teachers have joined the schools' faculty as replacements. Six teachers are on a year's leave: Miss Claude Aycock and Miss Katharine Clark of Balboa High School, Miss Mary Worrell of Cristobal High School, Miss Lois Morgan of Balboa Junior High School, Mrs. Elizabeth W. Rowley of the Gatun Elementary School, and Mrs. Alma Castel of the Margarita School. Back from extended leaves are Calmar Batalden, Director of Vocational Education, and Kenneth Vinton, science instructor at the Canal Zone Junior CollegeNeil Branstetter, who taught music at Balboa High School for many years, has been made supervisor of music for the white schools. Harold J. Zierten, formerly mechanical drawing teacher at Balboa High School, is the high school's new counselor. Kenneth Krogh, shop teacher at Balboa High School, has been named head of the La Boca Occupational High School shops. Other transfers are: Mrs. Dorothy Smith and James Stearns, from Cristobal Junior High School to the Cristobal High School faculty; Miss Grace Rider and Victor Herr, from the Balboa Junior High School to the faculty of Balboa High School, and Miss Borghild Hermo from the teaching staff of the Balboa Elementary School to that of the Balboa Junior High School. WEST INDIANS who helped to build the Panama Canal were honored August 15 when a special commemorative stamp was issued. Here Governor Newcomer talks with a group of the oldtimers at a ceremony at the Mount Hope Ball Park. THIS MONTH'S CALENDAR 7thÂ— AMERICAN LEGION, Post No. 6, Gamboa Legion Hall, 7:30 p. m. V. F. W., Post No. 3857, New Cristobal, 7:30 p. m. 9thÂ— STEAMFITTERS, No. 652, Balboa Lodge Hall, 9:30 a. m. PLUMBERS, No. 606, Margarita K. of C. Hall, 9:30 a. m. 10thÂ— CRISTOBALMA RGA RITA CIVIC COUNCIL. Margarita Clubhouse, 7:30 p. m. PEDRO MIGUEL CIVIC COUNCIL, Union Church, 7 p. m. BLACKSMITHS No. 400, Balboa Lodge Hall, 7:30 p. m. V. F. W. Post No. 727, Fort Clavton, 7:30 p. m. MACHINISTS, No. 699, Margarita K. of C. Hall, 7:30 p. m. V. F. W. Post No. 3822, Curundu Road, 7:30 p. m. AMERICAN LEGION, Post No. 1, Balboa Hall, 7:30 p. m. 11thÂ— AMERICAN LEGION AUXILIARY, Unit No. 1, Balboa Hall, 7:30 p. m. V. F. W. Post No. 100, Old Boy Scout Building, Cristobal, 7:30 p. m. PAINTERS, No. 1232, House 0838, Balboa, 7 p. in. ELECTRICAL WORKERS, No. 397, Balboa Lodge Hall, 7:30 p. m. AMERICAN LEGION, Post No. 7, Fort Clayton, 7:30 p. m. 12th PACIFIC CIVIC COUNCIL, Jewish Welfare Board, 7:30 p. m. AMERICAN LEGION, Post No. 2, Cristobal, 7:30 p. m. 16thÂ— CENTRAL LABOR UNIONMETAL TRADES COUNCIL, Margarita Clubhouse, 8:30 a. in. 17thÂ— ELECTRICAL WORKERS No. 677, Gatun Masonic Temple, 7:30 p. m. 18thÂ— OPERATING ENGINEERS No. 595, Margarita K. of C. Hall, 7 p. m. 19th -V. F. W., Post No. 40, Balboa K. of C. Hall, 7:30 p. in. A. F. G. E., Lodge No. 14, Balboa Clubhouse, 7:30 p. m. AMERICAN LEGION AUXILIARY, Unit No. 3, Gatun Legion Hall, 7:30 p. m. TEACHERS, No. 227, Balboa High School Library, 7 p. m. 20thÂ— AMERICAN LEGION AUXILIARY, Unit No. 6, Gamboa Legion Hall, 7:30 p. m. 21stÂ— V. F. W. Post No. 3857, New Cristobal, 7:30 p. m. 24thÂ— V. F. W. AUXILIARY, Post 3822 Post Home, 7:30 p. m. Panama Line Sailings For September From Cristobal Ancon September 7 Panama September 14 Cristobal September 21 Ancon September 28 From New York Panama September 5 Cristobal September 12 Ancon September 19 Panama September 26 25thÂ— OPERATING ENGINEERS, No. 595, Balboa Lodge Hall, 7 p. m. AMERICAN LEGION, Post No. 7, Fort Clayton, 7:30 p. m. V. F. W. Post No. 100, Old Boy Scout Building, Cristobal, 7:30 p. m. 26thÂ— AMERICAN LEGION AUXILIARY, Unit No. 2, Cristobal Legion Home, 7:30 p. m. A. F. G. E., Lodge No. 88, Margarita Clubhouse, 7:30 p. m. 27thÂ— GOVERNOR-EM PLOYEE CONFERENCE, Board Room, Administration Building, 2 p. m. OCTOBER 1 stÂ— C R I S T O B A L M A R G A R IT A CIVIC COUNCIL, Margarita Clubhouse, 7:30 p. m. PEDRO MIGUEL CIVIC COUNCIL, Union Church, 7 p. m. V. F. W. Post No. 727, Fort Clavton, 7:30 p. m. V. F. W. Post No. 3822, Curundu Road, 7:30 p. m. AMERICAN LEGION, Post No. 3, Gatun, 7:30 p. m. POSTAL EMPLOYEES, No. 23160, Balboa Lodge Hall, 8 p. m. 2dÂ— GAMBOA CIVIC COUNCIL, Community Center, 7:30 p. in. GATUN CIVIC COUNCIL, Gatun Clubhouse, 7:30 p. in. 3dÂ— V. F. W. Post No. 40, Balboa K. of C. Hall, 7:30 p. m. 4thÂ— CARPENTERS No. 667, Margarita Clubhouse, 7:30 p. in. September 7, 1951 THE PANAMA CANAL REVIEW Official Panama Canal Company Publication Published Monthly at BALBOA HEIGHTS, CANAL ZONE Printed by the Panama Canal Press Mount Hope, Canal Zone F. K. NEWCOMER Governor HERBERT D. VOGEL Lieutenant Governor E. C. LOMBARD Executive Secretary J. RUFUS HARDY Editor LETTERS TO THE EDITOR Letters containing inquiries, suggestions, criticisms or opinions of a general nature will be accepted. In all cases possible, letters to THE Review will be answered individually. Those of sufficient general interest will be published in this paper. Letters must be authentic and be signed although signatures wilf not be published unless requested and names of authors will be kept confidential. Return address should be given but The Review will not undertake to return correspondence of any nature. SUBSCRIPTIONS Yearly subscriptions to The Panama Canal Review to any address in the Postal Union: $1.00 Postal money orders should be made payable to the Treasurer, Panama Canal Company, and mailed to the Editor, The Panama Canal Review, Balboa Heights, C. Z. SINGLE COPIES The Panama Canal Review is on sale at all Panama Canal Company Clubhouses, Commissaries, and Hotels for ten days after publication date for: 5 Cents a Copy Single copies after the close of general sales and individual copies by mail : 10 Cents Each Back copies of The Review, when available, may be bought from the Vault Clerk, Third Floor, Administration Building, Balboa Heights, Canal Zone. No copies of the first issue are available for sale. SPECIAL BINDERS for the PANAMA CANAL REVIEW are available at the larger Commissaries and Clubhouses for 50 cts. EACH Specially made binders of genuine leather may be ordered direct from the Panama Canal Press for $7.00 each, and imitation leather binders may be ordered direct from the Press for $2.50. Both of the special kinds of binders come with your name imprinted in gold leaf. OF CURRENT INTEREST BALBOA LOST last month one of Ha oldest and best known landmarks. The old Balboa Police Station which had stood at the head of the PradoÂ— since 1914 Â— was sold on high bid and was demolished during the past month. It was originally built in Empire in 1906 and was moved to Balboa in 1914 when it became the Balboa Central Police Station. The police moved out of the building in 1936 when the station was transferred to its present quarters on La Boca Road. Since then the old station has been used variously by the License Bureau, the Silver Personnel Bureau, the Girl Scouts for storage, and the Schools Division. Since 1938 the upper floor has been used as a girls' dormitory for the Canal Zone Junior College. STOVE CLEANING FREE The present charge of $2 for the cleaning of electric ranges when quarters are vacated will no longer be made. Approval of the recommendation to drop this charge was given recently by Governor Newcomer. The monthly charges made for the use of electric ranges includes ordinary maintenance and replacement of parts. The cost of cleaning ranges after quarters are vacated will now be absorbed in the regular maintenance charges. Julian L. Schley; General Robert E. Wood, former Chief Quartermaster of the Canal and later President of Sears, Roebuck and Co.; and Chan Gurney, former United Slates Senator from South Dakota. NEW PHONE DIRECTORY Listings for the 1952 edition of the Panama Canal Company's telephone directory may still be made if received within the next few days, according to an announcement at the Electrical Division offices. While August 30th was originally set as the deadline for new or revised listings in the telephone directory, the additional time has been given to permit last-minute changes. The directory is scheduled to go to press late this year. Listings should be submitted in duplicate to the Chief of the Communications Branch, Balboa Heights. A charge of $1.50 is made for each original listing and 75 cents for each crosslisting. Phone books are given free to subscribers with each original listing. PUBLIC SAFETY PROGRAM Matters pertaining to public safety in the Canal Zone and particularly those related to a major disaster of any nature will be handled during this fiscal year by the Safety Branch. Edward M. Altman, Position Classifier in the Personnel Division, has been transferred to the Safety Branch as a result of the additional work. He will assume his new duties next Monday. He has been employed by the Canal for the past ten years, most of the time in personnel work. He is a member of the Canal Zone Bar and has served on several occasions as Acting Magistrate. The public safety program is designed to provide a coordinated program in the Canal Zone in event of any major disaster. GOETHALS MEMORIAL COMMISSION Three new members, including Governor Newcomer, have been appointed by President Truman to the Goethals Memorial Commission. Both of the others, Ralph Budd and R. H. Whitehead, are well known United States industrialists and were prominent on the Isthmus during the Canal construction period. The Goethals Memorial Commission was first appointed by President Franklin D. Roosevelt after a bill authorizing a suitable memorial to the famous Canal builder was passed by Congress in 1935. Some funds from the original appropriation for the memorial are still available but additional money is being sought to complete the project. Other members of the Commission now are: Former Panama Canal Governor DOCTOR NAMED TO WHO Dr. Amadeo V. Mastellari, Chief of the Tuberculosis Section of Gorgas Hospital and Advisor to the Health Director on Tuberculosis, has been named to the Expert Committee of the Tuberculosis Section of the World Health Organization of United Nations. There are seven members of the Committee chosen from a panel of about 50 tuberculosis experts from all parts of the world. The committee directs the work done in the field of tuberculosis by the international organization. Dr. Mastellari has been Chief of the Tuberculosis Section at Gorgas since April 1950 and through special arrangements with the Canal Health Bureau now serves as advisor for the tubercuslosis vaccinal ion program in the Republic of Panama. He has served as Director of the Panama Health Department, Director of the Tuberculosis Division of the Panama Health Department, Chief of the Chest Division of Santo Tomas Hospital, and consultant in the Panama Health Office. September 7, 1951 THE PANAMA CANAL REVIEW information needed to locate on the Canal diagram the numbered models which represent every ship. A glance at this board enabled the busy dispatcher to tell Southbound 5 to follow Southbound 4 down the west side of Pedro Miguel locks, or to order the proceed signal at La Pita signal station for a northbound vessel. The Marine Dispatchers are part of the force of the two Port Captains' offices. The Port Captains are Navy officers, on a two-year detail to the Canal. Senior of the two and, as such, Chief of the Navigation Division, is Capt. West at Balboa. Captain William S. Parsons of Cristobal arrived here last month. Theoretically the Balboa office controls transit traffic from Gamboa south. In actual practice the Balboa dispatchers handle all ships south of Gatun. Before leaving Gatun locks the pilot of a southbound ship learns from the Balboa dispatcher what time he is to pass Gamboa. Balboa handles most of the transit traffic, but Cristobal has more harbor work. Each side has an Assistant Port Captain, always a man with many years experience as a Canal pilot. Captain Everett 0. Swinson is Balboa's AssistantPort Captain; Captain Samuel L. Brown holds a similar post on the Atlantic Side. They are relieved by a senior pilot during vacation or other absences. Over 35 Years Of Service Balboa's Chief Dispatcher, Mr. Dickerson, has more than 35 years of government service. Cristobal Chief Dispatcher Forsstrom came to work for the Canal in 1916 and was made a dispatcher the following year. His assistant chief dispatcher is Merwin A. French, with J. T. Oliver in a similar post on the Pacific Side. Each office has seven dispatchers and Balboa has, in addition, one man in training. They work eight-hour shifts around the clock. The Chief Dispatcher is on duty ordinarily from 7 a. m. to 3 p. m. For Balboa, a new position has just been authorized which will put one additional man on duty from 2 p. m. to 10 p. m. at the time when most ships are in the Cut and traffic is at its peak. Balboa's dispatchers are: Mr. Yost, D. T. McNeil, J. H. Hunt, Mr. Wolford, and L. D. Bowman, with Preston Trim, Jr., in training. They are assisted by the following local rate dispatchers' clerks: E. C. Sterling, A. G. Smith, G. A. Lateau, E. H. Sealey, R. A. Padmore, E. E. Taylor and E. U. Petit. Cristobal's dispatchers are: Hermanns Kleefkens, Nelson R. Clark, Rufus C. O'Neal, Oscar 0. Brown, Jr., and William E. Weigle, Jr. Their dispatchers' cleiks are: A. R. Morrison, Dan Savage, Huntley F. Mignott, Wilfred E. Lindo and Lincoln B. Boyce. A dispatchers' duties have been called unforeseeable. The dispatchers agree but they add, "They're never dull." Editor's Note: This is the first of a series of stories concerning the men whose business it is to put ships through the Panama Canal. The next will deal with the boarding parties. The Panama Canal measures 40.27 statute miles from shoreline to shoreline but it is 50.72 statue miles from deep water to deep water. The airline distance from the Atlantic to Pacific terminals is 43.05 miles and the transit of a ship through the Canal ordinarily requires about eight hours. LIFTING SHIPS is just part of the day's work for E. C. Sterling, senior of the dispatcher clerks at the Balboa Part Captain's office. 'with his service with the Marine Divisions (now Bureau) dating back to 1916. When telephone calls report that a ship has passed a certain point in the Canal, he lifts |its [replica and [moves it farther along on the [miniature Canal. Born in Jamaica he came to the Canal Zone June 17, 1909. FORTY YEARS AGO In July August Culebra, now Gaillard, Cut was giving Canal Builders trouble 40 years ago. A fall of soft earth and rock covered steamshovcl 225 so that only the end of its boom was visible. Mud slid from the east side at Las Cascadas, blocking all tracks. The new breaks in the Cut's banks called for a revision of excavation figures. With 65,514,865 cubic yards excavated, 23,929,140 was still to be done. One man was killed, five hurt when a locomotive, drawing a coal-loaded flat car, ran onto a piece of track undermined by a slide on the Cut's west incline. The locomotive and car were thrown 40 feet into the cut. A premature explosion of dynamite at the Ancon quarry killed four, seriously injured two. Elsewhere construction moved along. About 59 percent of the concrete for all locks was in place; concrete work on the Gatun spillway was over 65 percent completed. The McClintic-Marshall Company was given the award for 22 spillway gates at Gatun and Mirafloies, along with two steel caissons and 22 pier-connecting bridges, as well as a contract for rising stem valves, guard gate valves, bulkhead gates and lock screens. Construction expenditures to July 1 totaled $4,399,772. Secretary of War Henry L. Stimson arrived July 13 for a 10-day visit. He walked the length of the Cut in two installments and inspected work of the Atlantic and Pacific divisions. His party included Brig. Gen. Clarence Edwards, Chief of the Bureau of Insular Affairs. The Canal Fortifications Board, headed by Maj. Gen. Leonard Wood, were also July visitors. The graves of 31 men, women, and children who had been buried during the previous 50 years on Flamenco (Dead Man's) Island, were transferred to the Ancon cemetery, now Ridge Road. Most had died aboard ships. Many were yellow fever victims. After 65 stowaways who had arrived early in July were given Canal jobs, others tried it. A search of one ship in Trinidad uncovered 65 men hiding; two more were found at Savanilla, another at Cartagena. All were put ashore and, as a warning to others, crewmen painted the heads and faces of some of the stowaways with red lead. Hotel business boomed. The Tivoli was getting a new wing and plans were approved for a "new hotel building of the Spanish colonial styleÂ— to be situated on Colon Beach." In preparation for the latter, the present Hotel Washington, the old hotel at this site was placed on rollers and moved behind Christ Church. And: The Isthmian Canal Commission was trying out a cement gun to prevent disintegration of rock in the Cut; plans were completed for a new University Club Building near Las Bovedas in Panama City; 4,200 free lunches were served at Cristobal's July 4 celebration; the Canal force totalled 32,690, a drop of almost 3,000 from the year before; a shipment of 29,363 cases of dynamite, the largest cargo ever brought to the Isthmus on one ship, was discharged in Cristobal; and bullfights, dog fights, and cockfights were outlawed. September 7, 1951 THE PANAMA CANAL REVIEW 11 Canal Zone Workers Are Highly Lauded For Response In Antiaircraft Training "The success of the Antiaircraft Civilian Auxiliary Program may be attributed entirely to the outstanding cooperation and assistance of the people of the Canal Zone, the Canal Zone Government, and the Panama Canal Company," Col. Sanford Goodman, Commanding Officer of the 65th AAA Group, told The Panama Canal Review. The results of the local training program, which ended August 25 with automatic weapon firing at a towed sleeve target and a radio-controlled target plane, will determine whether a similar program of training volunteers to man antiaircraft defenses will be undertaken in the United States. "Speaking for the men and officers of the 65th AAA Group," Col. Goodman continued, "may I take this opportunity to express our sincere appreciation for the fine work of each and every volunteer. "The enthusiasm, willingness to learn, and ready acceptance of the many responsibilities delegated reflect great credit not only on each individual but on the Canal Zone as a whole." The following 140 employees of the Panama Canal Company and the Canal Zone Government, or members of the families of Company-Government employees have served as volunteers in the test of civilian adaptability to an antiaircraft program: a. AAOC Group (1) Wire-Radio Communications Section Kenneth R. A. Booth, Lawrence C. Callaway, Robert A. Engelke, Everett L. Farlow, William D. Hardie, Doris R. Kintigh, Betty Lu Malone, Gladys E. Napoleon, Hans P. Pedersen, Florence M. Pierson, Edward Scott, Helen D. Walker, Melvin E. Walker, and Ella E. Wertz. (2) Plotting Section Martha M. Carriker, Doris C. Y. Chan, Garland F. Dowling, Patricia E. Kenealy, Beatrice E. Lee, Elizabeth W. McNevin, Eleanor D. Miller, Helen N. Minor, Muriel C. Treadwell, and Josephine P. Withers. (3) Switchboard-Teletype-M 209 Converter Section Helen Beil, Virginia K. Christian, Rosalie A. Demers, Willie Marie Duvall, Patricia B. Gregory, and Mary D. Parker. b. Gun Group ( 1 ) Gun Section William B. Allen, Woodford M. Babbitt, Lee R. Beil, Mirt Bender, James P. Boukalis, Bernard J. Brown, Benjamin S. Chisholm, John J. Crawford, Robert D. Daniels, John T. Dillon, John J. Dudak, Arthur J. Farrell, Clarence L. Foiles, Kerner E. Frauenheim, Fletcher R. Gregory, John W. Hare, John F. Hern, Charles F. Hinz, Charles J. Hinz, Clarence D. Howell, Charles W. Hummer, Charles T. Jackson, Jr., John J. Kennedy, Patrick Kennedy, De Wight M". Kers'h, Fred H. Lee, Frank D. Naughton, Gerald 0. Parker, James W. Riggs, William J. Rose, George H. Sanford, Earl E. Trout, Randolph N. Trower, Stuart Wallace, Howard E. Walling, William G. Wood, George C. Wright, and James M. Zelsman. (2) Range Section Helen E. Chisholm, Dorothy E. Cole, and Loretta M. Pace. (3) Radar Section Kathryn C. Hummer, Rose Hunt, Louise L. Jones, Beulah A. Sanford, Georgianna Stephenson, Ruth L. Straus, and Margaret F. Wiggin. (4) Communications Section Margaret E. Brandl and Antoinette Huff. c. Automatic Weapons Group (1) 40 MM Section Walter J. Allen, Robert L. Anderson, Thomas J. Breheney, John A. Everson, w ... .. A CIVILIAN antiaircraft gun crew waits tensely for their shell to meet the target in the clouds over a defense position. Seated in the center is Gayle 0. Kellar, Chief of the Panama Canal Safety Branch, lookout and lateral gun pointer for the volunteer crew. Standing above him is Louis M. Pacs, a Navy civilian employee. Passing the ammunition, and with his back to the camera, is John E. Ridge of the Municipal Division. His brother, Robert, an employee of the Oil Handling Plant, is behind Mr. Pace. Guy R. Exon, Roy E. Graham, Arthur J. Hanson, Murray D. Hawk, Russell E. Hellmund, Douglas S. Johnston, Gayl Kellar, Walter R. Lindsay, David H. Long, John J. McConaghy, Henry McElhone, William D. McGowin, James W. Myers, Jasper L. Myers, Antonio Orsini, Richard R. Peglar, Bronson B. Powell, John E. Ridge, Robert L. Ridge, Michael A. Romeo, Hugh B. Smith, Wesley H. Townsend, and John E. Winklosky. (2) .50 cal Multiple Machine Gun Section William E. Dobson, James R. Doran, Carl P. Hoffman, Sr., Pasquale P. Monaco, DeWitt E. Myers, Harry D. Raymond, William N. Taylor, James M. Thompson, William F. Young, Joseph L. Hummer, Norman C. Anderson, William L. Benny, Roy F. Burr, Robert A. Duvall, William T. Harness, Henry H. Lee, Jr. Ellis J. Lowe, Robert Lowry, John A. Morales, Gordon E. Walbridge, Fred E. Wells, and Russell T. Wise. (3) Communications Section Natalie C. Adams, Margaret L. Csighy, Constance G. Engelke, Alberta P. Lattimore, Mildred A. McMahon, Dorothea F. McNall, Elsie D. Naughton, Gertrude M. Roberto, Lorraine B. Schriftgiesser, and Margaret A. Spreadbury. Hearing Aid's Return Brings German Thanks E. T. Suse, of Hamburg, Germany, thinks the United States is pretty fine Â— all because of a hearing aid. Late in 1941 his Sonotone auditory apparatus was turned over to E. R. Carr, then Acting Chief of Customs at Balboa, for safekeeping. The exact circumstances have faded with the years but it is believed that Mr. Suse had been picked up with a group of other Germans and held here in immigration. He was sent from the Isthmus before the hearing aid could be returned to him. Several months ago he wrote and asked for it. At first it could not be found but later it was located, damaged by long storage in the tropics, and in June it was started to its owner. Recently he wrote acknowledging its receipt and concluded his letter: "The reason for writing you is caused by my surprise that an insignificant gadget could still be produced and returned to me after almost exactly 10 years. I think that is something unique in today's world and only possible in a country like the United States of America where the rights of the individual are not being stepped upon. "Please accept my most sincere and deep gratitude and the assurance that 1 should be very glad if I can ever offer to an American citizen a similar service and proof of integrity." The Atlantic entrance of the Panama Canal is 33.52 statute miles north of and 27.02 miles west of the Pacific entrance. 12 THE PANAMA CANAL REVIEW September 7, 1951 TEN YEARS AGO In July August War was casting its dark shadow fat (her over the Canal Zone ten years ago. Canal ports were closed from dark to dawn. After scores of fishermen were apprehended in the mine fields off Balboa and Cristobal, military authorities released for publication diagrams of the restricted areas. Woodrow Spier of Pedro Miguel became the first Zonian to be drafted. He was sworn into the service at Camp Paraiso. Defense bonds were soon to go on sale. Hunting licenses were revoked for the duration. Governor Glen E. Edgerton instructed heads of departments and divisions to conserve their use of magnesium, aluminum, tungsten, nickel, and zinc. The Commissary Division replaced metal caps for milk bottles with paper caps. Householders donated their old pots and pans to a scrap drive. Six Japanese ships which had waited for more than a week in Limon Bay to transit the Canal cleared from Cristobal to continue their voyages via Cape Horn or the Cape of Good Hope. The Canal Zone was busting at the seams in 1941. A police census showed a civilian population of 1,2,846, an increase of 13,368 in two years. Preliminary plans were announced for a $4,000,000 quarters building program, with new houses for Ancon, Balboa, Margarita, Cocoli, and Gamboa, and a $700,00 addition to Colon Hospital. The Margarita Post Office opened and work was being rushed on the first unit of Margarita Hospital. The Ancon Laundry, handling 45,000 pieces daily, asked customer cooperation in careful listing and wrapping. On July 24th, as a local newspaper reported it, "A Colombian stepped on a Jamaican's toe and set off another international labor riot." Altogether in July six such disturbances were reported. The largest, at Gatun, involved 2,500 men. Segregation of the laborers by nationality was recommended and local magistrates pleaded with the rioters brought before them for tolerance in relations with their fellows. _____ Work continued on the. Third Locks. A 225-Um suction dredge, towed down from Kansas City, Mo., was hauled overland to an artificial lake near the new Gatun Lock*. The site of the new locks at Gatun was ordered shifted 850 feet nearer Gatun Lake, onto better rock foundation. Six million bands if cement, nearly the total amount used during Canal construction, were ordered for the new locks. The Dredging Division began work on the north approach channel to the new Mirafiores Locks. Col. R. A. Wheeler, Engineer of Maintenance, was suddenly ordered to Washington, after 14 months of local duty. He subsequently sarved in Burma and later headed the Army's Corps of Engineers. He is now a member of the Panama Canal Company's Board of Directors. Other notes of the period: The first iron lung arrived for Gorgas Hospital; A. C. Medinger succeeded Leonard Foote as Assistant Superintendent of the Dredging Division; Gayle 0. Kellar was named Safety Officer; the Panama Line chartered two freighters; and Congressman Dow Harter praised Canal defenses after a brief visit here. Anniversaries Employees who observed important anniversaries in the United States Government Service during the month of August are listed alphabetically below. The number of years include all Government service, with the Canal or other agencies. Those with continuous Canal or Railroad service are indicated by (*) asterisks. 30 Years Robert L. Jordan, Tovvboat Master, Navigation Division. Richardson Selee, Civil Affairs Director. Christian Simonsen, Mechanic, maintenance and construction equipment, Municipal Division. 25 Years *Earl R. Baltozer, Meatcutter-in-charge, Commissary Division. *S. L. Churchill, Sergeant, Fire Division. Alfred B. Fox, Gauger, Division of Storehouses. Francis X. Kerr, Supervising Structural Engineer, Engineering Division. *Walter Van Vliet, Electrician, Aids to Navigation Section. Charles Walsh, Senior Foreman, construction and maintenance, Building Division. Robert M. Wilford, Assistant Master of Transportation, Railroad Division. Christian W. Wirtz, Administrative Assistant, Commissary Division. 20 Years Kenneth W. Anderson, Clerk, Municipal Division. *S. N. Belanger, Master of Transportation, Railroad,jDivision. *Joshua A. Cunningham, Policeman, Police Division. *Waldron E. Eldridge, Nurse, Gorgas Hospital. Manuel Lichtenbaum, Pharmacist, Gorgas Hospital. John A. Morales, II, Payroll Clerk. Finance Bureau. Charles E. Stepp, Investigator, Contrahand Control Unit. John H. Terry, Records Position Clerk, Personnel Bureau. Frank F. Williams, Cash Accounting Clerk, Commissary Division. 15 Years Paul Badonsky, Materials Engineer, Locks I division. *Eleanor D. Burnham, Librarian, Civil Affairs Bureau. Eulus C. Clemons, Electrical Welder, Industrial Bureau. Nick M. Elich, Principal Foreman, Municipal Division. Alton J. Hay ward, Machinist, Industrial Bureau. Winters A. Hope, Engineering Draftsman, Dredging Division. Alberta P. Lattimore, Retirement Clerk, Personnel Bureau. F. J. Meisinger, Traffic Clerk, Terminals Division. Charles G. Rickards, Senior Towboat Master, Dredging Division. *Walter T. Schapow, Instrument Maker, Industrial Bureau. Chester C. Turck, Tunnel Operator, Locks Division. Annual Dance Planned By Zone Fire Fighters The Canal Zone Fire Fighters are planning a Ball, to be held at the Hotel El Panama, Friday evening, November 9. Balls sponsored by the Canal Zone Police Association have long been features of Isthmian life, but the November 9th dance will be the firemen's first venture along such elaborate lines. The firemen hope that this will be the first of a series of annual affairs. Fred Huddleston is in charge of arrangements for the Fire Fighter's Ball. Tickets will go on sale in the near future. Canal Chauffeur Does Pencil Sketches PENCIL SKETCHES of people and places are made by McDonald Allen, a chauffeur at the Motor Transportation Division in Ancon, during his odd moments. .The above picture shows Allen with a pencil sketch he did of Governor Newcomer from a recent photograph. He has never taken any art lessonc and the knack of sketching what he sees is called by Allen "just a pastime." He has never attempted other art work, such as watercolors and oils. Born in Panama City, Allen is the son of two old-timers who came to the Isthmus during the early Canal construction period from their home in Barbados. He attended schools in Panama City and has been employed in the Canal Zone for the past 14 years, of which ten has been spent as a chauffeur for the Motor Transportation Division. Now 34 years old, Allen is married and lives in La Boca with his wife and young daughter. September 7,1951 THE PANAMA CANAL REVIEW 13 Leo Cagley Is Appointed Engineering Branch Chief The appointment of Leo Cagley as Chief of the Civil Engineering Branch of the Engineering Division was announced recently. The appointment was effective August 27. Until Mr. Cagley's appointment the position of Chief of the Civil Engineering Branch had been occupied by Wells Wright, in a dual capacity as Assistant Designing Engineer and Acting Chief of the Chief Engineering Branch. Mr, Cagley came to work with the Panama Canal in August, 1941, soon after his graduation from Iowa State He served in the Navy from 1943 to 1946 and recently completed a year of graduate study at Harvard University. Community Chest Heads Start Work On '52 Drive Plans arc now being made for the 1951Â— 52 Community Chest drive which starts October 1. The coming campaign will again be conducted by the Civic Councils. F. J. Moumblow, chairman of the General Committee of Civic Councils, will serve as chairman of the drive and Mrs. Douglas Johnston has agreed to serve again this year as director. William Jump is expected to again head the group which will handle solicitation in the local-rate communities. Budgets for the 1951-52 Community Chest are now being prepared, Mr. COMING EVENTS AT YOUR CLUBHOUSE THEATERS "TAKE CARE OF MY LITTLE GIRL" 20th Century-Fos Starring JEANNE CRAIN We are especially proud to exhibit this film, which has won unstinted praise from al' who have seen it. It is a merry tale of campus life and of the trials and tribulations of the co-eds who are away from home for the first time. We feel that we are very timely in presenting it at Balboa Theater on September 8, to coincide with the opening of another school year. "STRICTLY DISHONORABLE" M-G-M Starring EZIO PINZA Â— JANET LEIGH Except for those lucky ones who have seen him in "South Pacific," we have all heard a lot about Ezio Pinza, the great singing star, but we have not yet seen him. Now, however, he will be seen at Clubhouse theaters in this excellent picturization of an outstanding Broadway stage hit, "Strictly Dishonorable." The story concerns an opera star who is forced to enter into a "marriage of convenience" to escape a frame-up. You will have an opportunity to enjoy the justly famous singing voice of Pinza as well as to see a picture that will keep you laughing all the way home. "MR. BELVEDERE RINGS THE BELL" 20th Century-Fox Starring CLIFTON WEBB You all have seen, no doubt, the previous laugh-classics featuring the antics of Mr. Belvedere. In this, his latest vehicle, he takes over an old folks home to prove that "you can be young at 80." As usual, Clifton Webb plays his role with verve, finesse and earns a laugh a minute. He is ably supported by Joanne Dru and Hugh Marlowe. This is a picture that the whole family will want to see. "RICH, YOUNG, AND PRETTY" M-G-M Starring JANE POWELL Â— VIC DAMONE Miss Powell needs no introduction to Clubhouse audiences after her outstanding singing and dancing with Fred Astaire in "Royal Wedding." Vic Damone is well known through his Mercury recordings of "If," "Vagabond Shoes." and other hit tunes; however, this is his first appearance as a motion picture star. The picture is filled with gay songs, comedy, and is filmed in glowing Technicolor. KATHRYN "SHOW BOAT" M-G-M Starring GRAYSON Â— AVA HOWARD KEEL GARDNER This trio of capable young actors is well cast in the old favorite, "Show Boat." You all know both the story and the music from this great American musicale. As sung by these talented young stars, however, the score takes on a fresher and more pleasing meaning. Filmed in Technicolor, "Show Boat" is a real treat to the eye and to the ear. Moumblow said, and will be presented shortly to the Chest's Executive Committee. Funds totaling $33,753.18 have been distributed to 14 Canal Zone welfare or community activities which participated in the 1950-51 Community Chest drive, according to the final report of the auditors which has just been submitted to Governor F. K. Newcomer The remaining $3,178.77 of Community Chest funds remains on hand to begin the 1951-52 drive next month. Last October's drive, the fourth to be held in the Canal Zone, had a goal of $30,500, but this was oversubscribed by $5,370. It was conducted under the sponsorship of the Canal Zone Civic Councils, with Emmett Zemer as chairman and Mrs. Johnston as director. Agencies Received Their Quotas Agencies which participated in last year's campaign, their quotas and the amounts they received are shown below. In each case the difference between the quota and the amount received is the agency's share of the campaign expenses. Salvation Army: Quota, $5,000; expenses, $478.71; net, $4,521.29. Balboa Armed Services YMCA: Quota, $3,333.34; expenses, $319.14; net, $3,014.20. Cristobal Armed Services YMCA: Quota, $2,500; expenses, $240.98; net, $2,259.02. Girl Scouts: Quota $3,000; expenses $289.83; net, $2,710.17. Boy Scouts: Quota, $3,000; expenses, $289.83; net, $2,675.17, plus $35 which was received in personal checks from donors issued in the name of the Boy Scouts and delivered to the Scouts as part of their allocated funds. JWB Armed Forces Service Center: Quota, $3,333.32; expenses, $319.14; net, $3,014.18. National Catholic Community Services: Quota, $3,333.34; expenses, $319.14, net, $3,014.20. Corozal Hospital: Quota, $3,806.57; expenses, $364.75; net, $3,441.82. International Boy Scouts: Quota, $1,582.14; expenses, $153.06; net, $1,429.08. Margarita Cristobal Civic Council: Quota, $250; expenses, $24.42; net, $225.58. Gatun Civic Council: Quota, $250; expenses, $24.42 (quota authorized but payment not affected; this amount, $225.58, is banked as part of Chest funds). Gamboa Civic Council: Quota, $250; expenses, $24.43; net, $225.57. Pacific Civic Council: Quota, $250; expenses, $24.43; net, $225.57. Summer Recreation Program: Quota, $4,000; expenses, $384.27; net, $3,615.73. Campaign Expenses Total $3,347 The expenses of the campaign, up to December 19, 1950, totaled $3,256.55. This amount was charged against the quotas of participating agencies. Subsequent expenses increased the total operating expenses to the sum of $3,347.23. Supplies, printing, postage, telephones, and other miscellaneous expenses accounted for $1,139.39 of the campaign expenses for the 1950-51 drive. The remainder of the expenses, $2,207.84, was paid in administrative salaries. 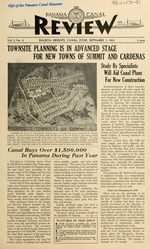 September 7, 1951 THE PANAMA CANAL REVIEW 15 Townsite Planning In Advance Stage For New Towns Of Summit, Cardenas (Continued from page l) advanced to present a picture of the birth of a town. Summit, with its total area of about 371 acres, has about 300 acres scheduled for town development. Location Of New Town The selected townsite lies to the right of northbound traffic on Gaillard Highway and roughly is between the present Gun Club and the Golf Club. This area was selected over an alternate site less than a mile away and nearer the Summit Experimental Gardens. Grading costs would have been less at the site nearer the Gardens, but utility costs would have been higher. Other undesirable features of the Gardens section were the proximity of the main highway and the railroad which would have divided the townsite. A major factor in the final choice was the fact that sewage from the area nearer the Gardens would have been drained into the Canal above the water intake at Paraiso. The new Summit townsite will accommodate a street development of slightly over 7.50 apartments and will give a population density of three and one-half apartments per developed residential acre. (The present Balboa Flats area has a population density of between eight and 11 apartments per residential acre). At the new town, 30 acres are set aside for a civic center and schools area. Plans call for a swimming pool, as well as outdoor recreational areas adjacent to the schools. In addition, five playgrounds for smaller children would be scattered throughout the residential area in such a way that no house would be more than a quarter-mile distant from a play area. Natural recreation areas would be provided at the edge of the townsite by thinning out trees, removing undergrowth and improving drainage. Summit Is Crescent Shaped At the present time the planners, local and visiting, envision Summit townsite as a crescent-shaped development. Its open end is toward Gaillard Highway in the direction of the prevailing breeze. There is room for future expansion, if this be needed, eastward and in the direction of the Pedro Miguel River. Ultimate plans may provide that the new town would be connected to the main traffic artery of Gaillard Highway by a divided entrance road. Traffic Coal Stock In Cristobal For Sale To High Bidder The bulk of the remaining supply of coal at the Cristobal Coaling plant will be sold this month to the highest biddei The Coaling Plant is to be closed at the end of this year and slightly over 12,000 tons of coal remain in stock. Of this, 10,000 tons will be sold to the highest bidder. The stock is run-of-the-mill bituminous coal. Bids will be opened September 20 and bid forms may be obtained from the Office of the Superintendent of Storehouses in Balboa, Canal Zone. The Cristobal Coaling plant, built soon after the Canal was opened, was once a busy place. The business declined as coal burning vessels were replaced by oil burners and the sale of coal last year dropped to an all-time low. leaving Summit toward Balboa would feed into Gaillard Highway through an underpass which would prevent drivers from having to make a left-hand turn across traffic. As the planners see it, Summit's internal traffic would be handled by feeder streets 36 feet wide and residential streets of a 26-foot width. (Gaillard Highway, in the section between the Tivoli Commissary and the Civil Affairs Building is 37 feet wide; the new section of Ancon Boulevard through the San Juan Place area has a width of 28 feet). The 26-foot roads in the residential area would allow parking on one side and permit two cars to pass, but would not be wide enough to encourage reckless, highspeed driving, Mr. Lewis pointed out. Summit's crescent layout takes advantage of the townsite's natural amphitheater terrain. Residential areas would be laid out on the rising ground on either side and one end of the flatter central space. On the steep slopes both onestory and off-the-ground houses would be so placed that the higher structures would have view and ventilation over the roof of the adjacent, lower houses. Location of Civic Center The civic center would be located in the more level center space of the horseshoe. As it is now seen, this civic center would be in the form of a hollow square, or pedestrian court, around which would be located the commissary, clubhouse, theater, and postoffice. Space would be provided adjacent to these buildings for offstreet parking and the schools area would be close by, but removed from traffic hazards. In this central area would also be half a dozen "public lots" for churches, etc. Bachelor quarters would be centrally located, with respect to Clubhouse cafeteria and bus facilities and the planners suggest that, since these concentrated, large units are prominent structures in a town of predominately low houses, they deserve particular architectural study. The family quarters would be spaced for maximum privacy, with about 60 feet between buildings and no house closer than 30 feet to the street. Large backyards would provide an area for what Mr. Rotsch feels is a neglected phase of Canal Zone life Â— outdoor living. The Summit area is not heavily wooded but what large trees there are would be left whenever possible. As Summit is planned, in this preliminary stage, the houses would vary in type, roof shapes, and color, and would include both onand off-the-ground construction. First Sewage Treatment Plant If Summit is approved as it stands in its present planning, it will have the Canal Zone's first town sewage treatment plant. (The Army has some such plants but there are none in the Panama Canal towns). This plant would be located so that waste, treated in sedimentation tanks and chlorinated, would be discharged through gravity sewers below Pedro Miguel locks. The same treatment plant would also serve the growing town of Paraiso. Canal Zone planners see each apartment equipped with an individual garbage disposal unit, provided these can be manufactured for 25-cycle current. Present plans call for Summit and other new towns to utilize the regular 25-cycle current, because of conversion costs and since there is a 10 percent power loss when conversion has to be done on the site of consumption. In addition, a particular local situation is that employees are frequently transferred from town to town in connection with their work. Warehouse And Storage Areas Other details which planners hope can be incorporated into the new development are a warehouse group, located well back from the highway and screened by landscape planting, to serve both Summit and Paraiso and to include parking space, warehouse and yard storage space for such units as the Municipal and Building Divisions, the Motor Transportation Divisions, and Grounds Maintenance Division, and a District Wireman's shop; removal of the high voltage transmission line from its present location, which would be through the edge of the community center and parts of the residential areas, to a location westof the highway and completely outside of the town; and location of Summit's electrical sub-station near the center part of the town but removed from the residential areas. The sub-station would be accessible to, but removed from major streets. Other problems on which the planners have been working include some connection with the "outside world" for Margarita, where a large expansion is planned in preparation for which a traffic check was made late last month, arterial connections for the new local-rate townsite of Cardenas, and the waste disposal problem on the Atlantic side. Cardenas, which straddles the Army's Corozal-Clayton "back road," will comprise roughly 280 acres lying between the Rio Dos Bocas and Cerro Corozal. A major problem for this new town will be the connection at heavily travelled Gaillard Highway and the main entrance road to the new town. An additional problem on which the visitors have been consulting with local planners is that of the remodeling of Balboa where the work of reducing population densities is now in progress as part of the overall housing and town planning program. Canal Buys Over $1,500,000 In Panama During Past Year (Continued from page 1) is indicated by the list of products. It contains some 75 separate items among the agriculture products, and about 50 different classifications of the industrial and miscellaneous purchases. The heaviest buying among the items for industrial uses are cement, building materials, office equipment and supplies, parts for automotive, electrical, and machinery equipment, and paints. Among the miscellaneous items bought in Panama during the past fiscal year, the largest amounts were spent for film rentals; periodicals, newspapers, and printing; and photographic work and supplies. Over $125,000 was spent both for film rentals, and for periodicals, newspapers, and printing. Purchases of photographic work and supplies totalled over $50,000 in value during the past year. Two extensive trips were made during the past year by Commissary Division representatives in an effort to stimulate and develop additional markets for products sold in the commissary stores. The last of the two trips was made in May by F. R. Johnson, Assistant Supply and Services Director, in company with representatives of the Panama Government. 16 THE PANAMA CANAL REVIEW September 7, 1951 Scrap Metal Salvage Here Again Aids Nationwide Drive To Avert Shortages Scenes reminiscent of World War II are being reenacted at the Balboa Storehouse scrap yard where hundreds of tons of scrap metal are being gathered, sorted, and made ready for shipment to the steel mills and foundries in the United States. Approximately 2,700 tons of ferrous scrap are being offered for sale and bids will be opened September 10. In addition, bids were opened last week on 150 tons of non-ferrous scrap metal. The collection of scrap metal is a part of a nationwide program recently launched on a regional basis by the National Production Authority. In charge of the Canal Zone program is Jerome F. Prager, Superintendent of Storehouses, who was recently appointed Scrap Salvage Administrator for the Panama Canal Company. Mr. Prager is well acquainted with the task of ferreting out scrap metals by long experience during the past war. The Storehouse Division was awarded a pennant early in 1945 for its work in the collection of scrap metal for the war effort. During that period three supervisors, two crane operators, and 85 local-rate workers were engaged in the program. Nation Inventories Low Inventories of scrap iron and steel at the Nation's 200 mills and foundries are dangerously low, the National Production Authority has announced, and unless scrap supplies are appreciably expanded within the next few months the steel production program may be seriously affected. The accompanying pictures indicate the extent and some of the work required in processing scrap before it is shipped. In the upper picture, a locomotive crane is hip-deep in unclassified scrap being unloaded. A heavy cutting machine shown in the middle picture, is used to reduce some of the material to proper size. Heavier scrap is cut by torches. The lower pictures shows hundreds of tons of metal in the scrap yard ready for shipment after being classified and cut. The scrap collection program has the following objectives: 1 A search of all properties for dormant scrap, such as obsolete machinery, tools, jigs, dies, fixtures, and other abandoned equipment which is broken or worn beyond repair. 2. A survey of potential wrecking and dismantling projects likely to produce scrap, such as abandoned buildings and other obsolete or useless material. 3. The collection and disposition of all iron and steel as quickly as possible through normal channels. All units of the Canal organization have been requested to cooperate. The general public can also greatly assist, Mr. Prager says, by reporting any items of abandoned scrap metal which may have been otherwise overlooked. An example of this kind of aid was recently given by a report of a large collection of metal in the jungle area near Madden Dam. The Scrap Salvage Administrator is now waiting for the coming dry season to cut trails to the find so it can be cut and the metal hauled to the Balboa yards for salvage. ~ W S| f=s W .11 r"i"Â™^^ H oo^^^= "^ i o> = Â— O i r* ^ IP -n 1 -g=o Â• C?l_^_^ Ol r-i E *k > ^"*^ M ^Series "E" Bonds May Be Held For Ten Years Longer A reminder has been given to employees that their United Savings Bonds of Series "E" may be held up to 10 years after maturity. An increasing number of employees will have "E" Bonds mature this year and those who plan to take advantage of the plan approved by Congress to hold the bonds up to ten years longer are not required to take any action. The extended bond will earn simple interest on the face of the amount at the rate of two and one-half percent for the first seven and one-half years, and thereafter at a higher interest rate to provide an aggregated return for the 10-year extension period of 2.9 percent compounded. If Series "E" Bond holders desire, they may exchange their bonds in amounts of $500, or multiples, for a current issue of Series "G" of the United States Savings Bonds. These earn interest at the rate of two and one-half percent a year which is payable semi-annually. This series is redeemable at par any time after six months of issue date on one calendar month's notice.